The episode Peter really changes our understanding of the series. The revelations reverberate both backwards and forwards through the story, it redefines our understanding of where Walter came from and his relationship with Peter and puts a whole different slant on the relationship with the parallel universe. What developments in Walter’s life can we expect to see in the final episodes of the season, now that we know it was Walter who initially broke through to the other side, and what of Peter? I think the inevitable one is that obviously we go down a path where Peter must find out. He must find out that Walter is not his real father, and we have to deal with the repercussions of that, which we do in this season. That’s one of the major lines through the rest of the season: How does Peter cope? It takes us some pretty crazy places, let me tell you. 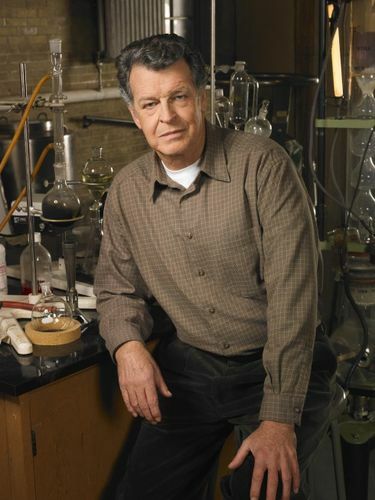 It’s also hard to play because Peter and Walter have been so close and I think one of the endearing things about Fringe has been the way that they have cautiously re-embrace the relationship. And I know from talking to people that that’s one of the things that people like most, that relationship between father and son, and indeed between Josh and I, so we’re going to have to challenge that. We will get it back but it won’t be the same. How do you as an actor approach Walter’s social eccentricities as an actor and how you plot his social evolution through the series? Every few episodes, you see him get just a little more away of the social conventions of simply communicating and interacting with people. The danger with Walter is that he can always revert at any moment and I’ve always been conscious of it and I speak to the writers about that. He’s always on a very fine edge that he could tumble back into insanity at any moment. However, because of the fact that he’s probably a lot cleaner, in terms of drugs, than he was then and he’s not being bombarded daily with incredible anti-psychotics and electroshock therapy and isolation therapy and all the horrible things that happened to him in prison hospital, that he is becoming socialized again. But it’s dangerous. It’s logical that he does improve, as much as he can given that we have learned that he’s had certain types of short-term memory removedâ€”that was in episode 210 I believeâ€”when we realize that the reason he can’t remember things is that he had certain part of his brain has been removed, and even though the brain can repair, you don’t get the memories back. So that’s another issue we have to deal with and that frustrates him, as we see. But he is becoming a member of society and valuing that and a lot of that through the love and affection and relationships that he has with Peter and Astrid, who is so kind to him, and Olivia, there is a very rich relationship there. He’s becoming socialized again, he’s becoming tamed, as it were, but it’s all going to be challenged, isn’t it, if the relationships fall apart, and that’s what we’re going to be exploring in the rest of the season. How different was it to take the character back to 1985 in Peter and show us who Walter Bishop was 25 years ago? In the sense in my preparation to find the Walter that we all know now, I had to go back to him right at the beginning to see where he came from. So that process was started before the pilot really, what was this man like before he deteriorated, so I was able to revisit that. Physically, of course, what I had to do was capture the energy, to capture the physicality of the man, the vocal physicality of the man, this was my task. I was aided enormously by my hair and makeup and special effects people here in terms of getting the overall, and indeed wardrobe helped a lot as well. And then we shot through these beautiful lenses that we got a different feel to the episode than we would now. All of those elements work together to create this version that you see in the episode. I spoke with Jasika Nicole earlier and told her that my favorite emotional moment in the series was the episode where she was accompanying Walter in Chinatown and got assaulted, and when she returns to the lab, with blood running down her face, Walter sees her and his face goes ashen and his voice drops, like a parent seeing a child who has just been hurt, and with a sense of responsibility that hits him hard. It cuts right to the heart of his character, to me, how Walter is learning to connect and feel and how it makes him vulnerable to those emotions again. That was a really special moment, I have to tell you, and I’m not sure it was meant to be as powerful as it is, but certainly that Jasika Nicole and I have developed, we saw it as an incredible opportunity to do something real. If you care about somebody, you realize you are responsible for them, and because the last thing you expect from Astrid, this tough little girl who always has a smile on her face, and then you see her absolutely shattered but still trying to clean up the lab. It was heart wrenching and that was the first time we’d ever seen Astrid vulnerable. I loved that moment too, Sean, I thought it was fantastic. Do you try to surprise Jasika in the episode when you come up with different variations on her name? I think a lot of that, in the beginning, was simply because he wasn’t able to get it right. Astrid is an unusual name anyway, it’s not Mary or June or Betty, and I really think he remembered that there was an “A” in there somewhere but he just kept getting it wrong. Less so now, you notice. Occasionally when he’s very excited about something he’ll still get it wrong, or very preoccupied, but I think a lot of us do that. You’ve been in families where parents get their kids’ names wrong. It does happen. But less so now, he does know her name is Astrid Farnsworth, he does know that now, so when he drops back now it’s more of a shock, whereas previously it was the norm, wasn’t it? He always got it wrong. But it’s left us with an interesting little tool to use every now and again to make a point. Walter has a very complicated backstory with William Bell but to date we have not seen them in any scenes together to this point. Do you have any scenes with Leonard Nimoy coming up and what kind of light do they shed on Walter’s relationship with William Bell? You know, I’m not going to exactly tell you that. That’s a really key resolution that we take in the final couple of episodes. We have wonderful scenes together that we have already shot, I mean really substantial scenes together. Leonard’s back big-time in the final couple of episodes. Obviously it’s something people have been screaming about, the resolution, and in fact we bicker like two old ladies and then finally the truth is revealed. I’m not going to say any more than that really, because it’s a terrific reveal, but yes, Leonard and I do spend a lot of time together. I wasn’t fishing for spoilers because I like to be surprised. I like to be carried along by characters and then have a narrative surprise reveal something new about a character, or clarify something that you didn’t realize you already knew. That’s interesting, isn’t it, sometimes you don’t realize that you knew something and you say, “Oh golly, yes.” I agree with you, Sean, I like that too. Often we have people saying, “Tell us what happens,” and we say, “Well, no.” Because really, that’s part of the joy of the episodes, isnâ€™t it, to get a reveal like that. But suffice to say that Leonard and I do a lot of work together and I have to say that it was a complete joy to work with him. He’s a true legend and a delightful gentleman as well. I’ve always believed that stories are really about what happens to people, not what happens in plots, and I think that the second season of Fringe has really taken the show deep in that direction. I love the second season and I’m really happy that you were renewed. I look forward to the end of this season and a whole new season to follow. Sean, thank you for that, and I agree with you. I think what we’ve done in the second season is have a look at the people that were populating these stories. The “monster of the week” is interesting, I suppose, but it’s not what carries our show. There’s a development and we’ve done a lot of development this season and I think we can continue to do that. That’s where we want to go.